We have moved to Chicago. 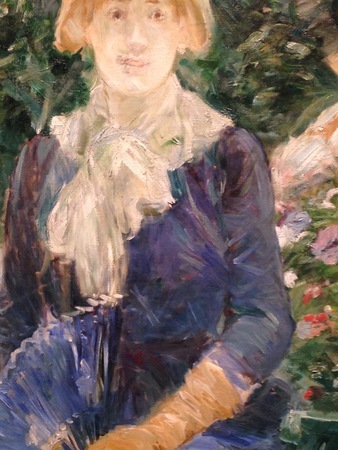 I went to the Art Institute soon after we arrived and was happy to see that the museum has a wonderful Berthe Morisot. I have wanted to keep thinking about her. I find that I remember vividly each experience I’ve had of her work in the last few years: two watercolors from the Clark, an exhibition at the Met that had several of her paintings, a visit to the Musée Marmottan while M played with S in the public gardens. 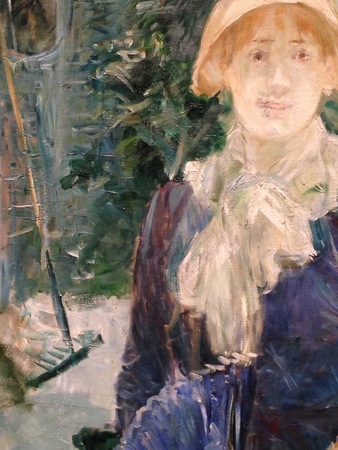 The peculiar density of atmosphere that Morisot achieves seems like something to learn from. 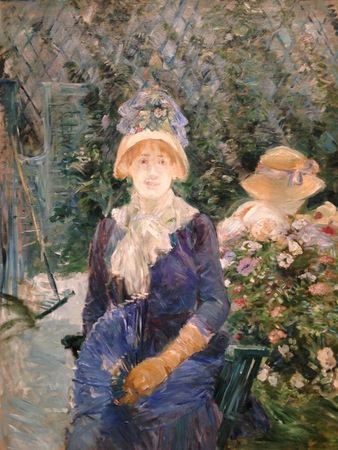 Perhaps I am affected by knowledge of her biography, and her early death, but it feels to me as if she knew there might not be much time, and that she put everything she knew, about a person, a child, a garden, a hat, into each painting. One thing, I think, is that she is able to keep everything in motion. This morning, a first day of school, the perpetual motion of everything and everybody – all our objects, all the four of us, all our places and people – feels overwhelming, but look at how she brings the garden to the dress, the fan away from and toward the dress, the dress itself toward blue, toward purple, toward the body and the air. I don’t think it is a photographic accident that the face of the woman becomes clearer and more meaningful when looked at with the hat and figure of the child behind her. 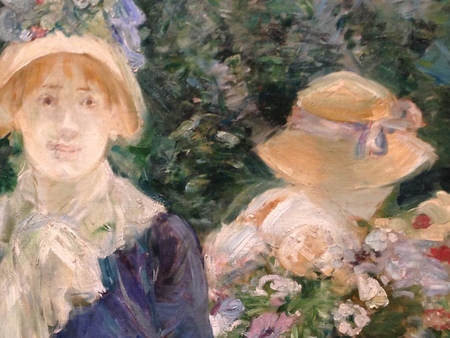 Morisot has done something with the beige and white shades of their two heads and hats that allows my eye to make a relation between the two figures. The woman’s face becomes less ghostly, I see what she thinks about and how she feels happiness and even love across those green strokes to the child. When I look back at our pictures of the summer, I see that we were often sitting where sand or green plants or water made a continuousness between us and the children. I feel I will miss this in the greater distinctness of fall. In summer there is the challenge of making meaningful and definite that which is blurred by heat and continuity and abundance. Morisot has not forgotten the work of it. This morning, I am especially fond of that rake, like a paintbrush, like a pen, to one side.